Do you have any hoses or tubes that I can attach to my sink faucet? I'm trying to fill something with water from my sink faucet that won't fit in the sink. I'm thinking maybe a hose or tube to attach to the faucet. Using a pitcher or something else would be awkward. Do you have any hoses or tubes that I can attach to my sink faucet? The other end won't be attached to anything. I&#39;m trying to fill something with water from my sink faucet that won&#39;t fit in the sink. I&#39;m thinking maybe a hose or tube to attach to the faucet. Using a pitcher or something else would be awkward. Do you have any hoses or tubes that I can attach to my sink faucet? The other end won&#39;t be attached to anything. 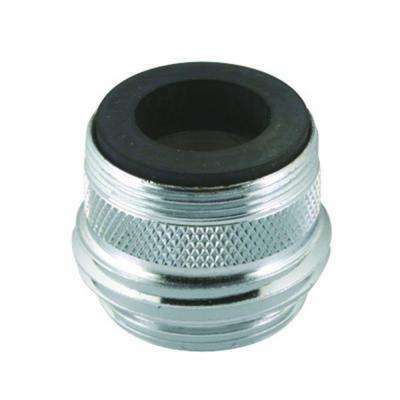 There are adaptors that replace the aerator of a sink faucet that allow you to connect a garden hose. The challenge with sink aerators is that there are several different sizes of threads and some have the threads on the inside, others on the outside. I would suggest taking off your current aerator and taking it to Home Depot where an associate can help you find suitable adaptor. If you don't have a garden hose you can buy a short length designed for connecting a hose reel to the house spigot.